Performing Arts students at The Sixth Form College, Solihull got a taste of undergraduate study this week thanks to a masterclass from De Montfort University Leicester. 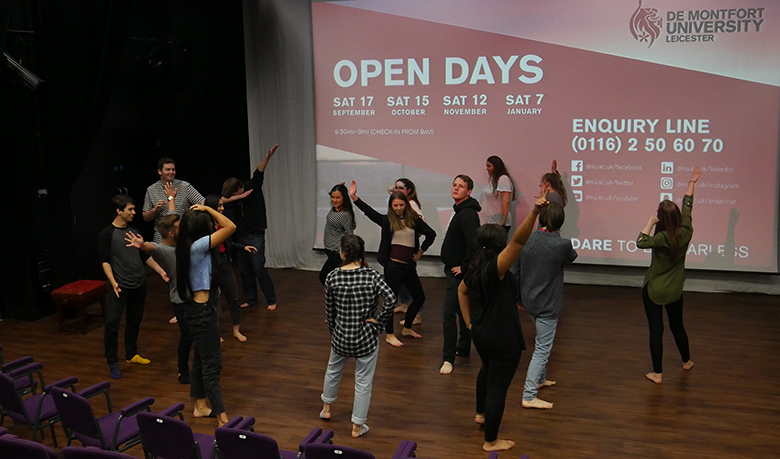 A level Dance and Drama & Theatre Studies students took part in the event, with a talk and workshops forming part of a 90-minute masterclass. Staff and students from De Montfort’s Performing Arts faculty were in College to deliver these exciting sessions, which got the student participating in practical exercises and starting to think about what they might do after they leave College. Drama students were split into three groups to take part in physical theatre workshops. These involved movement, speech and group interactions and encouraged students to improvise, creating interesting textual meaning. Dance students were taught a piece of degree level contemporary choreography and were encouraged to work as an ensemble to manipulate its speed and dynamics in response to a piece of music. The workshop had a key focus on group work and collaboration rather than relying on the use of mirrors in class. Dance and Drama are just two of the A level subjects taught under the Performing Arts umbrella at the College; Music and Music Technology are also offered. Performing Arts sits within the Creative Arts curriculum area, which also offers A levels in Fine Art, Graphics, Photography and BTEC Art & Design. More photos from this Masterclass are available on our Facebook page.